With over 3000 people and 17 monarchs buried in the grounds, it is hardley surprising that a number of spirits have lingered on to haunt Westminster Abbey. The ghost of Father Benedictus is a common sighting at the Abbey. In the 6th century the area of Westminster was an inhospitable island that rose from the marshy banks of the Thames where the Tyburn Stream joined it. It was the location chosen by Serbert, the newly converted king of the East Saxons, on which to build a church dedicated to St Peter and consecrated by Mellitus, the first Bishop of London. Legend tells how, on the night before the consecration, a fisherman rowing besides the south bank of the Thames was stopped by a cloaked stranger and asked to row him across the river. As the vessel reached the opposites shore, the newly completed church was suddenly illuminated in a celestial brilliance and singing angels filled the blazing night sky. The stranger, then revealed himself to be St Peter, and having anointed the church's walls with holy water, proceeded to dedicate his own church. For nearly five hundred years, the Benedictine abbey flourished on the site, until Edward the Confessor rebuilt it in January 1066. A few days after its re-consecration, Edward died, and Harold was crowned King of England. He was defeated by William of Normandy at the Battle of Hastings in the October of that year, and on Christmas Day 1066, William the Conqueror was crowned King in Westminster Abbey. 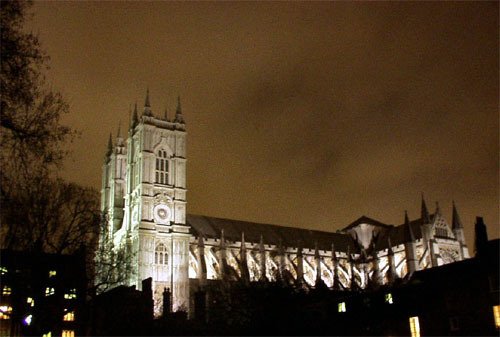 The tradition of coronations has been taking place in Westminster Abbey ever since. With over 3000 people and 17 monarchs buried in the ground of Westminster Abbey, it is hardley surprising that a number of spirits have lingered on, to haunt Westminster Abbey. The ghost of John Bradshaw who presided at the trial of Charles I walks Westminster Abbey's Triforium, occasionally surprising some of the thousands of tourists who flock there every day. In the South Cloisters, a marble seated statue of Daniel Pulteney holding a book has sometimes been known to turn a page or two. Over the centuries that followed Westminster Abbey was considerably expanded and altered and, in the process, the floor level was progressively lowered, which may be why the ghost of a monk who is known to haunt Westminster Abbey, is reported as floating a little way off the ground. He is known as "Father Benedictus". He is most often seen floating around the cloisters at five or six in the evening. His spectral figure appears quite solid, and has been known to hold conversations with witnesses, many of who don't realise that he is anything more than mere flesh and blood. In 1900 he kept a group of visitors entertained for a good twenty-five minutes as he drifted around the cloisters and then backed slowly towards a wall where he melted into the fabric. In 1932 two American visitors even held a long conversation with him and later commented that they had found him to be extremely polite. 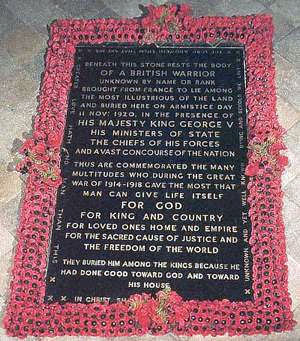 The Westminster Abbey's Tomb of the Unknown Warrior is a poignant memorial to the soldiers who died in World War 1. On 11th November 1920, the complete, though unidentified body of a soldier was given a royal funeral and then buried in soil brought specially from the battlefields of France, beneath a marble stone quarried in Belgium. From time to time when the crowds have gone and the Abbey settles into quite stillness, a ghostly soldier materialises alongside the tomb, and stands, head bowed, for a few minutes, before slowly dissolving into thin air.